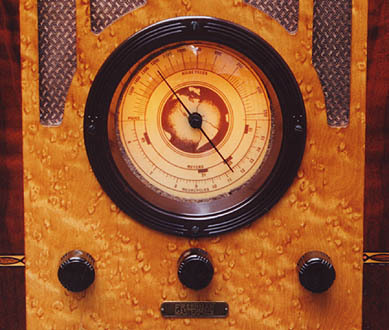 It's barely noticeable, but this radio's cabinet is trapezoidal—slightly narrower at the top than the bottom. The cabinet's front displays numerous veneers. The contrast between the birdseye maple in the center and the cherry veneer on each side is striking. 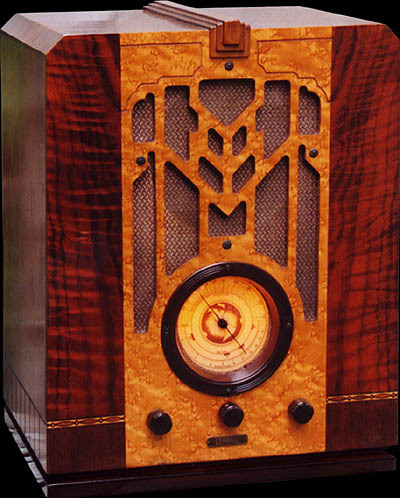 It must have been even more striking to the eye of the 1934 buyer, who saw nothing but walnut veneers on other potential radio purchases. Just to make sure all the bases were covered, Belmont also included two rectangles of walnut veneer, below the strips of inlaid marquetry. Approximately 16-1/4 inches / 41 cm tall, including that silly but pretty embellishment on top. 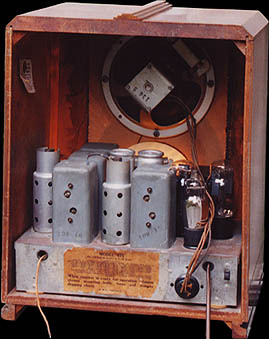 Tube Complement: 57 mixer, 27 oscillator, 58 IF, 2A6 detector, 2A5 audio amplifier, 80 rectifier. 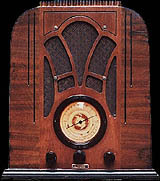 The dial. Look at that wonderful wood! The back. This is another model 675. Same Belmont chassis, different Belmont cabinet.